Beautiful Handmade 100% cotton African Maxi Skirt in a gorgeous vibrant Ankara print. 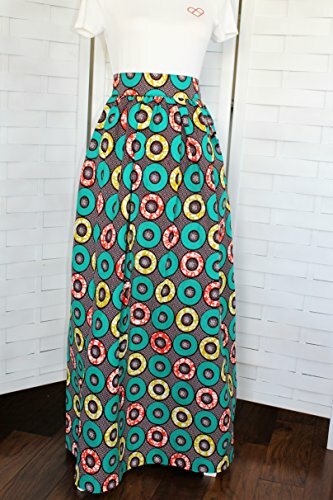 This is full, gathered, and lined 42" long maxi skirt with 2-inch high waistband, back zip closure and 2 side seam pockets that work for either day or night. Lining allows more use throughout the year - wear it during both warm and cold kinds of weather. Please measure your waist size and select the size the fits you best. Hip sizes don't matter as this skirt is full around the hips. If you have any questions about this product by Mawufemor Apparel, contact us by completing and submitting the form below. If you are looking for a specif part number, please include it with your message.